Definition: A stack refers to a deck of cards in a specific order so one can perform a magic effect. An example of an easy card magic trick that begins with a stack is "The Count." A spectator freely selects a card which is lost in the deck. At this point, the spectator can freely cut the face-up deck. 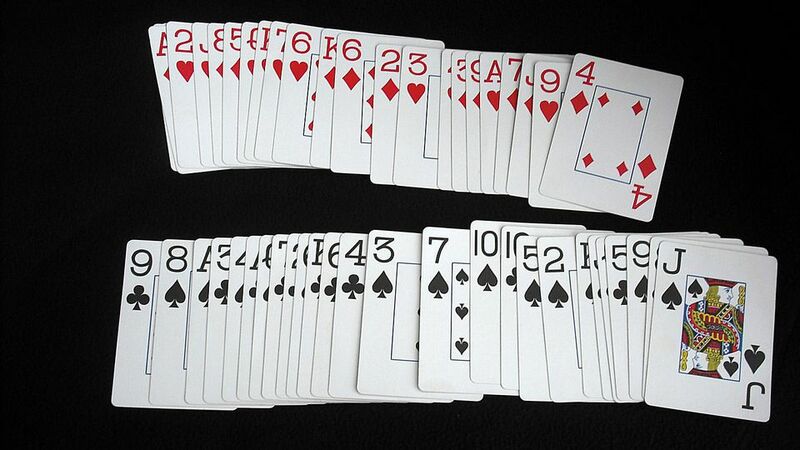 At some point, the spectator stops cutting and the number represented by the card (ace through ten, jack - 11, queen - 12, king - 13), is counted from the top of the deck. To the spectator's amazement, his card is located at that location. Here, the deck has been arranged in a prearranged order to accomplish the trick. The spectators don't know about the predetermined order of the deck, which is the secret. With the cards in special order, this allows spectators to continually cut the card and eventually locate the volunteer's freely selected card. Many tricks in our collection of easy card trick rely on stacking the deck, either partially, with only four or five cards in a specific order or more. In the case of "The Count," it's a quarter of the deck. One easy trick that we teach called "Incredible Spelling" is a packet effect where all of the cards are stacked. Here, you spell the name of the card and deal cards from the top of a packet down to the bottom. Each card that you spell to and eliminate is the exact card. This effect is quite different as it's far more of a stunt than a magic trick. Furthermore, and interestingly, the stack at the beginning of the trick is in a specific order, but it appears to be random. But this seemingly random order allows for the trick to occur. Another trick, How to Deal a Royal Flush, relies on a stack of five cards and it's the process of dealing and apparently mixing the cards that causes the deck to ultimately end up in the order so a royal flush - ten, jack, queen, king and ace of a suit - gets dealt to you, the magician. In this effect you shuffle a deck and then deal five hands, which each don't show anything in particular. The cards are gathered and then dealt again, and the magician ends up with a royal flush. It appears to be a demonstration of considerable gambling and sleight of hand skill, but it's actually a very easy magic trick. Yet another easy card trick that relies on a stack is called "The Five Card Trick." In this first rate beginner's trick, you not only discover a spectator's freely selected card, you find the four aces (or any other four of a kind that you wish). Magicians sometimes rely on complete stacked decks that come in two general forms: 1) cyclical, one card reveals the location of the cards before and after it; and 2) Memorized, each card in the deck is designated at a specific location in the deck and knowing the location of one card allows you to calculate the location of any other card. Depending on the stack, the deck may still be partially shown to contain different cards and be in a random order. Tricks that rely stacked decks are infinitely enhanced and more convincing when a magician employs a false cut, which you can learn here. Of course, Most stacked decks won't allow spectators to examine a deck or freely mix it. Examples: The trick relied on a stacked deck.